Last week I mentioned that the Wolfe Pack was having their annual Black Orchid Banquet on Saturday in New York City. One of the highlights of that event is always the announcement of the Black Orchid Novella Award. Last year the winner was James Lincoln Warren and we published his acceptance speech here. This year the winner happened to be, well, me. 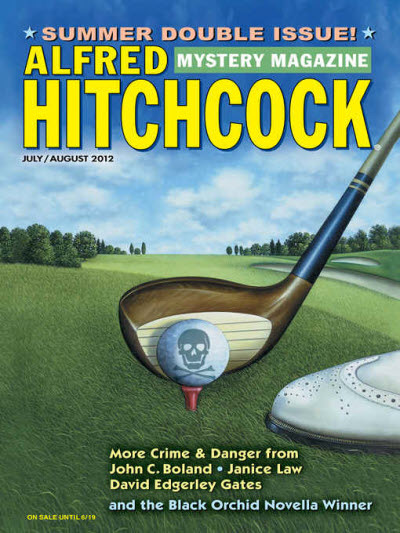 "The Red Envelope" will be published in the July/August 2013 issue of Alfred Hitchcock's Mystery Magazine. My acceptance speech is below. I grew up in Plainfield, New Jersey, back when the city had a lovely old Carnegie Library. But there was a problem: by the fifth grade I had used up the children's room, wrung it dry of everything I wanted to read. And that was a problem because children were not allowed in the adult section. So I would make guerilla raids down the narrow book-lined hallways that led to the cathedral-ceilinged main reading room, keenly aware that if I were caught the librarians would banish me back into exile with Dr. Seuss and Mary Poppins. I quickly figured out that the best place to hide was the area directly behind the reference desk, because the librarians there seldom turned around. That happened to be the mystery section. And so it happened that among the first adult books I read were The Mother Hunt and Gambit. Of course over the years I read all of the Rex Stout corpus. And reread it. The results was that I became a lifelong mystery reader and a mystery writer as well. Which brings us to tonight. So I would like to start by thanking Rex Stout, without whom, as they say. And I want to thank the library staff in Plainfield, New Jersey. I don't hold a grudge, you see. I even became a librarian myself. I want to thank the Wolfe Pack, and especially the awards committee, which has shown such excellent taste. And my favorite editor, Linda Landrigan of Alfred Hitchcock's Mystery Magazine. Linda, I believe three of my stories are waiting in your slushpile. Also, the librarians and staff of Western Washington University, where I did my research. "The Red Envelope" is set in Greenwich Village in 1958, so there was a lot to check up on. 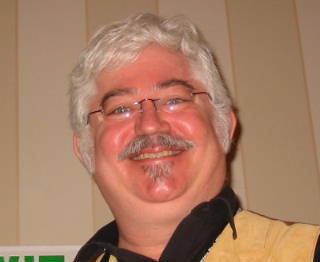 I need to thank my first readers, last year's winner James Lincoln Warren, and R.T. Lawton. Who knows? Maybe he will be next year's winner. Couldn't have done it without you guys. Finally there's my wife, Terri Weiner, who puts up with my work even though she really prefers science fiction. Thanks, honey. And to all the rest of you, please keep reading mysteries. Congratulations! And way to keep it under your hat. "We have to go to NY for a conference", right. I was lucky to live in a small town and have a small town library. Once I had picked a book she would have me read the first paragraph. If I could do that she let me take the book out even if it wasn't a "children's book". Congratulations again, Rob. Great speech, too. Wonderful news, Rob, and couldn't have happened to a better writer. I'm looking forward to reading the story. Congrats again, Rob. I love the detail of where you hid and why. I'm so happy for you! And how I loved that beautiful old library. I remember it more from my high school years when I learned to write research papers and look up "Mick Jagger" and "James Brown" in the Guide to Periodical Literature. Thanks for all the kind words, folks. I'll write something about the banquet in 2 weeks. Zeke, it was NOT easy keeping my mouth shut, but I had to honor the Wolfe Pack's request to make it a surprise. My sister Diane was the one who pointed out the lovely old picture of the Plainfield Library. Sis, kids today don't know about the Reader's Guide to Periodical Literature. When I was in library school we warned that people would come in asking for "the green books." Congratulations! Can hardly wait to read it! Once again, sincere congratulations! As David said, this couldn't have happened to a better writer, or a nicer guy. Rob, it's a well deserved award for an excellent story. I feel privileged to have read "The Red Envelope" during its early stages. And thanks for mentioning my name in that august group. I can't buy advertising like that. Let me add my congratulations. Well deserved. Your childhood library was considerably larger than mine. And there was no Rex Stout, either. I am so happy for you!! And I look forward to reading "The Red Envelope." Congrats, again, Rob. And, I'm anxiously awaiting the story, too. I have fond memories of using the "Reader's Guide." I still use it when I have the opportunity. I even bought a volume for a couple of bucks years ago! Congratulations again, Rob! Thanks again, all. Jeff, the story of how Wilson Co. Which published Readers Guide, lost the automation wars is a sad one. I was at the banquet to help celebrate Rob's victory, and there was an amusing error in the program. It listed the title of Rob's excellent story as "The Red Elephant". If "The Red Envelope" is a novella, maybe "The Red Elephant" is a novel . . . It was a pleasure sharing a table with James (Linda Landrigan was between us, trying to get a word in edgewise). The envelope to elephant reminded me of James Thurber complaining about an editor who turned a bead in one of his stories into a bear, which I imagine changed the meaning considerably. It also reminded me of the jokes about a stamped undressed elephant.